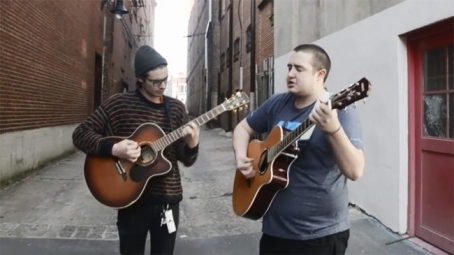 Recorded at Lollapalooza, this Stereogum Sessions perfermance has Brendan Lukens and Jake Ewald of Modern Baseball playing a stripped-down take of “Apple Cider, I Don’t Mind,” found on the band’s latest album Holy Ghost, which is available via Run For Cover. The instrumental simplicity enhances the aesthetic of intimacy, highlighting the deep, personal lyrical nature. Those expressions of hope and doubt intermingle, as one feels close like a member of the crowd.